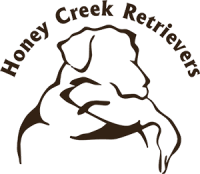 Honey Creek Retrievers is a full time retriever training facility located in north central Ohio. We are owned and operated by Trent & Lisa Cleland who offer twenty years of retriever training experience. Our goal is to produce a stylish, enthusiastic & reliable retriever to perform in any situation. Our Program is dedicated to develop retrievers to their full potential. Whether it is a hunt test, upland hunting or spending countless hours in the duck blind. Each retriever will receive a custom program to best fit you and your retriever.